George Washington, the first American general, president, and national hero was born in rural colonial Virginia on February 22, 1732. After the early death of his father, a young George Washington (only seven years old at the time) learned the ways of farming and planting as he became the primary owner of his family's plantation farm. He stayed at home throughout his early teenage years, helping his mother run the family's estate. At the age of fifteen, George became a surveyor. He was able to land this prestigious job through vital connections that his older brother, Lawrence Washington, possessed. Lawrence Washington was close partners with the wealthy Colonel William Fairfax, a very wealthy Virginian politician and landholder. After receiving a good word from the influential Colonel Fairfax, George Washington not only became a successful surveyor, but also was placed in a position to gain land and political positions. Upon the death of his brother Lawrence, George achieved his first political position in Virginia's Northern District. Furthermore, Colonel Fairfax took the young Washington under his wing as a role model and a sort of surrogate father, fostering in the ambitious George Washington a yearning to also learn about the art of war. 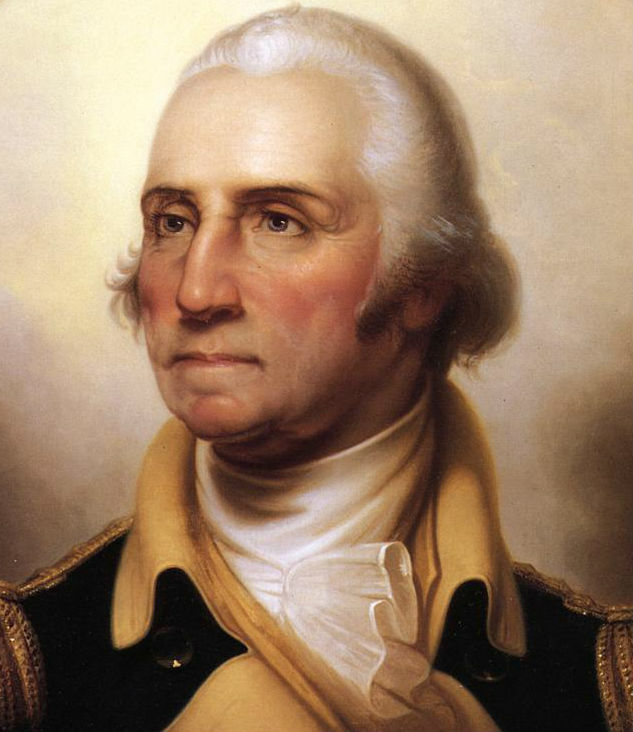 Following a failed attempt to enter the British Royal Navy (thwarted, in part, by George's mother), Washington finally got his chance to serve in the militia. Much of the surveying work that George did was for the Ohio Company, operated by the Fairfax family. A dispute between France and Great Britain over western lands in the Ohio territory prompted Fairfax to send George Washington on a scouting expedition to the lands in question. His mission was to deliver notice to the encamped French forces that the land was claimed by the British. Straying from his original orders, the impulsive young commander led an attack on a French scouting party. Not only was this attack Washington's first taste of the battlefield, but also it was crucial in sparking the Seven Years War between the two main colonizers of North America: France and Britain. Upon returning to Virginia, Washington joined the British imperial army, serving under General Braddock. It was during the Seven Year's War that Washington first achieved a hero's status on the battlefield during his mid-twenties. In one account, General Braddock and his army walked into a French and Indian ambush. As British officers rapidly fell in the battle, George Washington remained alive, surviving bullet holes in his jacket and horses being shot out from underneath him. He did his best to carry out the wounded General Braddock's orders for the remainder of the tragic battle. Although the battle was a horrific loss for the British forces, Washington returned to Virginia as a war hero. Although this status was not fully merited (due to Washington's significant lack of military knowledge), it helped to boost his popularity in the eyes of both the public and the prominent. After the end of the Seven Years War, Washington returned to civilian life with his marriage to a wealthy Virginian widow named Martha Dandridge Custis. George's marriage to Martha united both of their already wealthy estates. Therefore, Washington spent much of his time after the war tending and expanding his vast estate. Moreover, the newly famous Washington re-entered politics as a representative in the Virginia House of Burgesses. However, life during this time of peace was short-lived as the pivotal encounters with the British at the battles of Lexington and Concord soon propelled the American colonies into the Revolutionary War against their mother country, Great Britain. In June 1775, George Washington was appointed the Commander in Chief of the Continental Army. Washington's experience as the commander of the colonial forces was a mixture of success and failure, embarrassment and glory. One of his most significant losses was the capture and occupation of New York City by the British forces. The loss of this major colonial city greatly frustrated Washington, but every latter attempt he made to retake New York either failed or never materialized. On the other hand, his two small victories at Trenton, New Jersey and Princeton, New Jersey were crucial in both mending Washington's reputation as a war general and in boosting morale among the rebel colonial forces and civilians. After several other key victories with the aid of the colonies' foreign ally France, the British ended the Revolutionary War and relinquished their control of the American colonies with the signing of the Treaty of Paris at Yorktown, Virginia on September 3, 1783. Following the conclusion of the American War for Independence, George Washington initially refused to become the national leader and instead returned again to civilian life in order to tend to his suffering estate. However, Washington did shortly accept the invitation to run for the office of the first President of the United States of America. At the age of fifty-seven, he became the only U.S. President to receive every vote from the Electoral College. George Washington served two terms as President, afterwards retiring for one last time to his home at Mount Vernon. The United State's first President, icon, and national hero died in his home on December 14, 1799. His name and legacy, however, continued to live on for years in the nation which he himself had served to found: the United States of America.